St Mary & St Ambrose originated as a mission of St. Bartholomew's, Edgbaston, being first licensed in 1885; it was called St Ambrose' mission church from 1889. A new church, built in brick and terracotta in the Gothic style on a site given by Lord Calthorpe, was consecrated in 1898 as the church of St Mary and St Ambrose. This is a large church with north-west tower and spire and apsidal west baptistry, built of bright red brick and deep red terracotta dressings and details, in a Decorated style. The mullions, tracery, pinnacles and finials are all in crisply modelled terracotta. There are nave aisles, short transepts and a chancel and a clerestory above the terracotta faced arcades. A parish was assigned out of St. Bartholomew's in 1903. 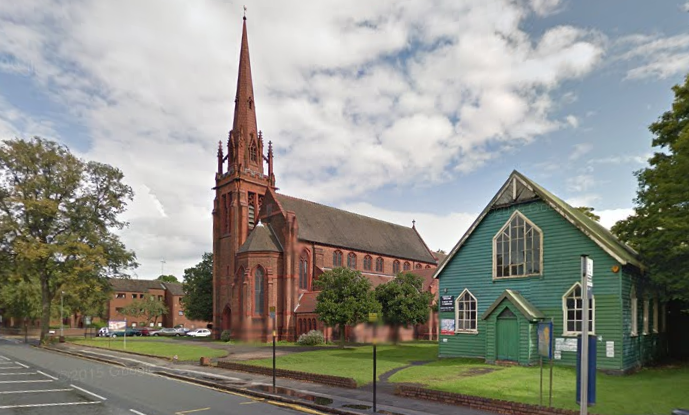 The church hall was originally the church of St Agnes, Moseley. Historic England website - https://historicengland.org.uk/listing/the-list/list-entry/1076224.